← The Condition of the Cattle Market…. Peregrine Palmer Acland, 71, of Gloucester St., an author and officer serving in the First World War with the 48th Highlanders, died Saturday at Sunnybrook Hospital. A native of England, Mr. Acland was educated at Upper Canada College and the University of Toronto. He was a son of F.A. Acland, a former King’s Printer in Ottawa. Prior to the First World War, he worked as a cowboy in the West, then became a newspaper editor in Prince Rupert. 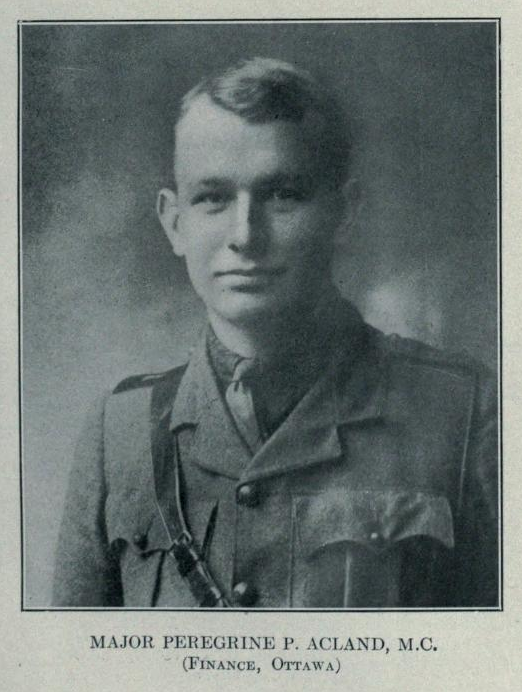 In 1914 he was commissioned in the 48th Highlanders at Toronto and went overseas with the 15th Battalion. He attained the rank of major and was awarded the Military Cross. He was severely wounded during the Battle of the Somme. From 1918-1920, Mr. Acland was schoolmaster at Groton school for boys is Massachusetts. Subsequently he entered the advertising business in New York and later Toronto. He was a member of the secretarial staff of the late prime minister Mackenzie King from 1942-1948. Mr. Acland was the author of a widely acclaimed war novel All Else’s Folly [sic] and numerous magazine articles and poems. A series of articles on the North he wrote for the old Toronto Globe told of his impressions and experiences when he walked from Prince Rupert to Winnipeg in 1912, before the Canadian National Railways line was completed. One of his poems, Faithful For Ever, was in salute to the unveiling of the memorial to the 48th Highlanders at Queen’s park in 1923. Mr. Acland leaves his wife, the former Mary Louise Danforth of Cleveland, and a sister, Mary Acland of Ottawa. A screenshot of the Globe & Mail obit appears to the left. Presumably, Peregrine Acland’s cause of death can be determined in the previous sentence. One of the perils of relying on newspapers as a primary source to uncover information on authors like Acland is that they are frequently wrong. The better papers err only in minor details, but one often finds glaring errors in lesser publications. Acland’s G&M obit is fairly accurate, though contains the following errors: he was born in Toronto, not England, though he did attend boarding school in the U.K. prior to attending Upper Canada College. He actually worked on Mackenzie King’s secretarial staff until January of 1949, not 1948, and sadly, they have garbled the titled of his novel (as did nearly every one of Acland’s obituaries). Finally, this obituary writer suggests that Acland walked from Prince Rupert, British Columbia, to Winnipeg Manitoba. Google maps tells me on today’s roads, depending on the route, that means a trip of between 2757 and 2824 kilometers. That didn’t happen. Acland left the staff of the Prince Rupert Daily News on September 3rd, 1913. One doesn’t amble across northern BC, into Alberta, Saskatchewan & Manitoba in the fall. In the Pearson’s Magazine article available elsewhere on this site, Acland claims he tramped “300 miles” across northern BC –and even that is a gross exaggeration, but I’ll detail this in another post. An abridged version of the G&M obituary was carried by the Canadian Press, and appeared in several newspapers across the country. The Lethbridge Herald, which I mentioned in a previous post, was one of the papers that carried Acland’s obit. The mistakes here are more pronounced, but demonstrate how easily information gets garbled in newspapers. Acland never worked in Prince Albert, Saskatchewan. But one can envision an ink-smudged wire story, where some editor sees “Prince” followed by “…..ert” and thinks, ‘that’s gotta be Prince Albert, Saskatchewan’ because he’s never heard of Prince Rupert, BC. Again, the novel’s title is mangled, and let me assure you, Acland was never the commanding officer of the 48th Highlanders. But he was a cowboy, however briefly, and it’s a nice touch that this was included in the Western Canadian versions of his obituary. If anyone reading this is in Toronto, and has an opportunity to photograph Peregrine Acland’s headstone in Mount Pleasant Cemetery, please get in touch. This entry was posted in Uncategorized and tagged Obituary, Peregrine Acland, Prince Rupert. Bookmark the permalink. 4 Responses to Peregrine Acland’s Obituary…. Thank you for this. Even with the aid of the Globe & Mail’s own search engine I’d been unable to track down any obituary – and so assumed it didn’t exist. Let that be a lesson to me. I’ll make certain to bring along my camera when I’m next in Toronto. I live in Toronto. If you still want the picture, I can try to get one later this week or on the weekend. Great blog, btw. Praymont –thank-you for the compliment as well as the offer, but I’ve since had both Brian & another reader take photographs of Acland’s headstone for me. But thank-you. Glad you’ve found my blog. Project Gutenberg Canada has just published Acland’s novel All Else is Folly. Just thought you’d be pleased to know. A publisher had planned to reissue it in 2012, but cancelled. It is grand that it is available again.